For seasonal brunching, we like this Pumpkin-Apple French Toast by Serena Wolf of the blog Domesticate-Me, sent to us by grocery delivery service Peapod.com. Prep time is 10 minutes, cook time is 15 minutes. This recipe works best with slightly stale (day-old) bread.For a richer French toast, replace half of the milk with half-and-half. If you don’t want to use butter, substitute coconut milk. Pumpkin French toast topped with sautéed cinnamon apples. Photo courtesy Domesticate Me | Peapod. 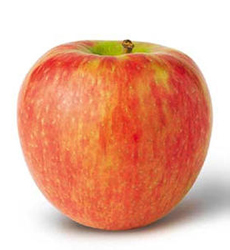 A Honeycrisp apple. Photo courtesy Rainier Fruit. 2. WHISK together the eggs, pumpkin purée, milk, brown sugar, vanilla extract and spices in a large baking dish (at least 9”x13”). 4. HEAT a griddle or large skillet over medium heat. Add a butter to the griddle/skillet. When melted, carefully remove the bread from the custard and place on the griddle/skillet. You’ll probably need to do this in two batches. Cook for about 3 minutes until golden brown. Add another bit of butter, flip the French toast, and cook for another 3 minutes or until golden brown. 5. 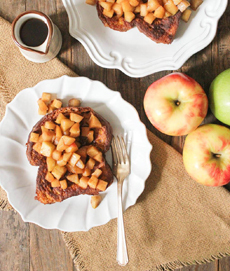 TRANSFER the French toast to plates and top with the warm apples. Serve with a pitcher of maple syrup on the side.